A black community’s ode to the oppressing government written by a white person. What could go wrong? 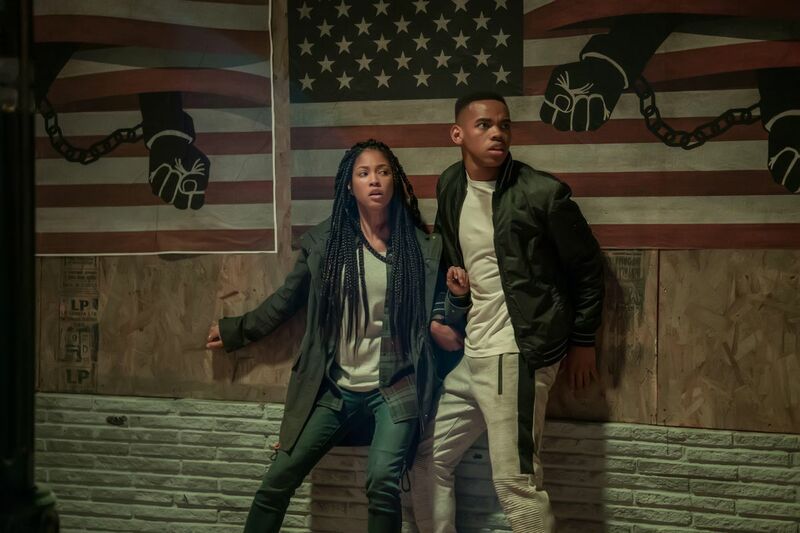 As the title suggests, “The First Purge” takes the audiences back to the moment, when the idea of one-day-crime-it-all is initially born. The social experiment takes place in Staten Island – a poor district, where gangs rule in the streets. Nya (Lex Scott Davis) is the good spirit of the neighborhood, she also strongly refuses to back up the idea of the purge. When the first alarm goes on, she soon realizes that the only person ready to protect her is the crime lord of Staten Island, Dmitri (Y’lan Noel). Back in 2013, James DeMonaco has written the original “The Purge” – a film immersed in violence, but rescued by an intriguing concept from the verge of thriller and science fiction. It was quickly followed by two more parts, each one worse than its predecessor. Still, none of the was such a hilarious calamity as “The First Purge”. “The First Purge” is a prequel to all of the three mentioned above. The beginning of the film is an attempt at painting the political unease, which leads to the formation of a new party and very radical changes in the American social landscape. It’s rushed, because DeMonaco is much more interested in the second part of the story – razzmatazz. The introduction is therefore a lesson of cliches – the protagonist is a poor girl, who rebels against the political establishment. Then, there is a cringeworthy gangster, a mixture of John McClane from “Die Hard” and 50 Cent. I’ll remain silent about the name Dmitri. They talk about class struggle and inequality etc. We all know this story. The build-up to the famous alarm sirens and the bloody mayhem takes an awful lot of time, spent mostly on acting extremes gone wrong. 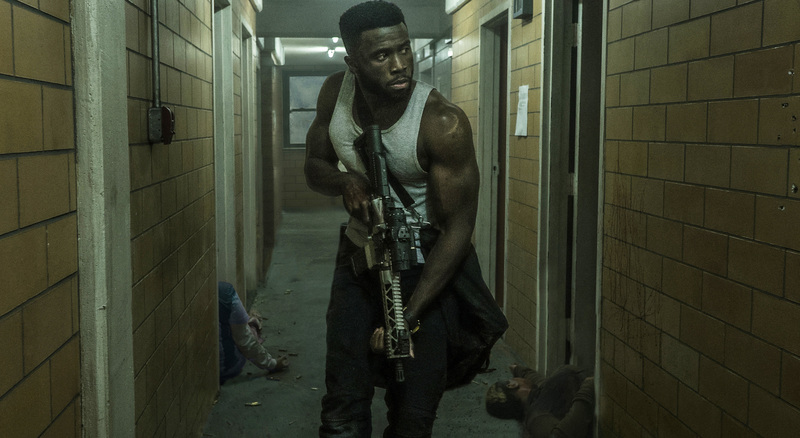 It’s either ruthlessly bored Marisa Tomei (as the founder of the purge), who seems to struggle with figuring out her lines and there is Rotimi Paul, whose over-the-top role as a junkie-gone-berserk Skeletor is as stunning as stupid. There is also a drop of soap opera delivered by Mrs. Davis and the dreary Dmitri with his half-wit pack. Once we’re done with the eye-rolling, anti-Trump agenda (because that’s what the first half feels like), the purge actually begins. And here’s the thing – what would you do during a whole night of people being legally armed and ready to cut’n’slice every human they see? I’ll tell you what – party in the street, of course. So we see Skeletor stabbing a girl in the crowd, with Marisa Tomei’s character commenting that “her data didn’t indicate that behavior”. Yeah. 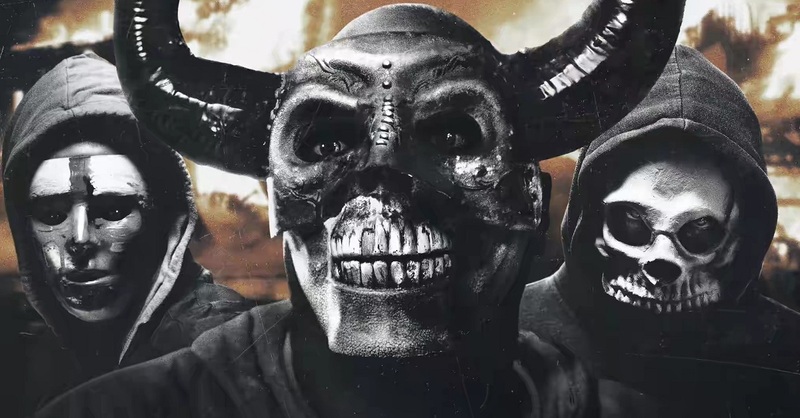 “The First Purge” turns into a “Straight Outta Compton”, but without any of its wit and meaning. People appear on screen dressed in “edgy” masks, gangs try to seize the opportunity and eliminate each other. It’s an ill-inspired version of “Boyz n the Hood”, a film that could easily be directed by Uwe Boll without any severe deterioration. Apart from Dmitri fighting for his position in the drug world and Nya running around the city in flames – there are Uzi-wielding nazi mercenaries, ku klux klan and white people (duh?) on motors. It’s “The Black Panther” on acid. I must admit that this mayhem is still quite an awesome comedy. Once you begin to ignore the shameful political razzmatazz that DeMonaco and his director Gerard McMurray are pushing so hard, “The First Purge” turns into the kind of cheesy B-movie thriller, where rationalism is traded for show-offy effects. Dmitri can actually pull off the McClanesque charisma at times, while the bullet-spraying finale is actually a satisfying ending to that whole mess. A wise man once said that a crappy movie shouldn’t bring forth more crappy movies. “The Purge” has started a franchise, which shouldn’t exist in the first place. Having said that, if there is ever going to be a next installment, I am officially asking DeMonaco to keep the momentum going. Let’s bring in more cringe, because this train’s crash is inevitable anyway. In all seriousness, get yourself some hammering booze unless you want to feel an excruciating pain of yourself losing brain cells.